The War of Art by Steven Pressfield was a solid book about creating things, with the fundamental idea being that you just do the work, it's about being a pro. Pressfield writes of how being a pro is to metaphorically carry your lunch pail and show up each day to put in work. You start at a certain time and go, you don't worry about inspiration and you don't get caught up in worrying about producing something great on a given day. The pro has learned that success comes as a by-product of work, the amateur has delusions of grandeur. If you're a pro, you're doing it because it's important to you, and a pro does things because they're part of who they is. 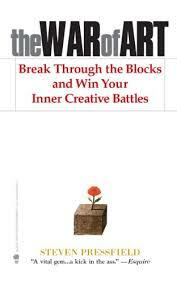 The book also covers the idea of resistance, how we're naturally inclined to invoke resistance rather than executing towards a worthwhile goal that helps oneself or helps others, whether it be it an artistic or business venture, a diet or health regimen, education or a program of spiritual enhancement, or a principled stand. Resistance is fed by our fear and being a pro is how you fight it. Another idea that stood out from the book is that a pro considers what they do to be as a corporation, with the work they produce in effect being "for services of." This also let's someone separate their work from themselves a bit, the work is for the corporation, it's not who they are, and producing that work is magical or mysterious, it's simply decision and implementation.